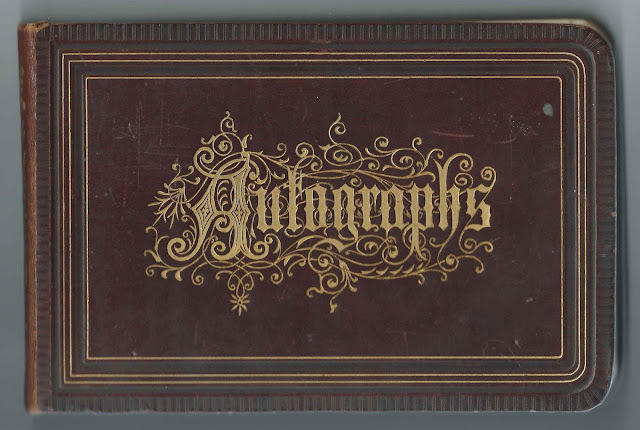 Autograph album kept by Nellie Howe (Reynolds) Hutchinson of Canton, Maine from 1878-1905, before and after her marriage to Wallace Everett Hutchinson. Although several of the inscriptions predate Nellie's marriage, she apparently added the page below at some point after her marriage. 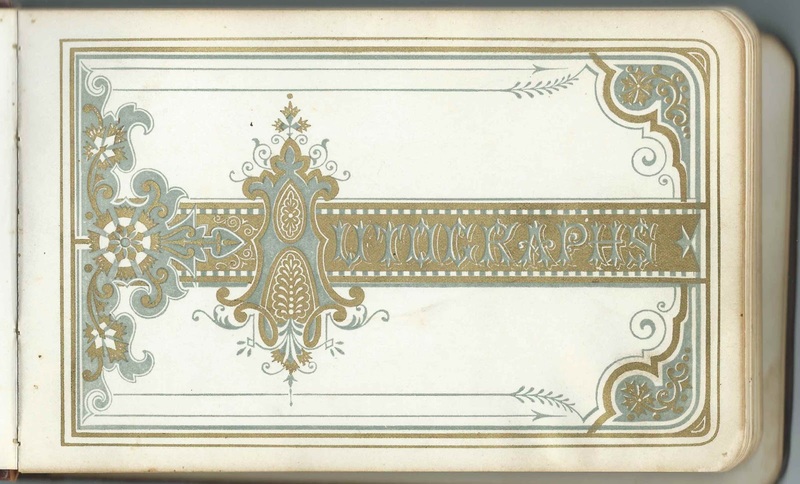 The album measures approximately 7-1/2" by 5" and contains the sentiments of 35 of Nellie's relatives and friends. An alphabetical surname list and an alphabetical list of the inscribers, together with any personal information they left, appear at the end of this post. According to her death record, Nellie Howe Reynolds was born December 15, 1861 at Canton, Maine, the daughter of Thomas Reynolds and his first wife Sybil B. (Howe) Reynolds. Sybil died in 1866, and Thomas subsequently married Livonia Hutchinson. Thomas and Livonia inscribed pages in Nellie's album, Thomas in 1878 and Livonia in 1885. Interestingly, Thomas mentioned Herdsdale Farm, which was owned by New York City merchant Warren Ward. Thomas may have been the farm's manager. The house shown in this link may be the house that the Reynolds family called home. On April 25, 1880 at Weld, Maine, Nellie Howe Reynolds married Wallace Everett Hutchinson, son of Luther Hutchinson and Julia (Winters) Hutchinson. According to his death certificate, Wallace was born April 26, 1857 at Weld, Maine. 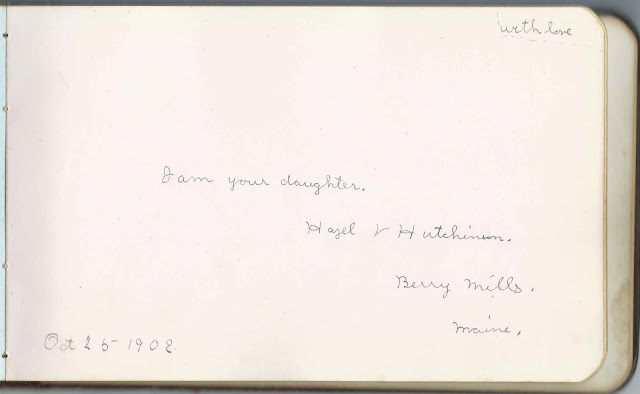 I believe Nellie and Wallace had four children, one of whom, Hazel Velma Hutchinson inscribed a page in her mother's album and gave her residence as Berry's Mills, Maine. Wallace died in 1915 and Nellie in 1920; they're buried in the Pine Grove Cemetery at Canton, Maine. If you have corrections and/or additions to the information above, please leave a comment or contact me directly. Paternal aunt-in-law Louisa A. (Babb) Reynolds of Canton, Maine; widow of Daniel Reynolds, Jr. I. W. Hathaway, or J. W. Hathaway, of East Milton, Massachusetts, inscribed on March 29, 1897. C. M. Holland of Canton Point, Maine, inscribed on April 15, 1880. He was Cornelius Marshall Holland, husband of Lydia H. (Reynolds) Holland, who inscribed the right facing page. Cora M. Holland, inscribed at Canton Point, Maine, on March 28, 1880; Nellie's cousin. She was Cora Madella Holland, daughter of Cornelius Marshall Holland and Lydia H. (Reynolds) Holland, who was a brother to Nellie's father Thomas Reynolds. Lydia H. Holland of Canton Point, Maine, inscribed on April 15, 1880. 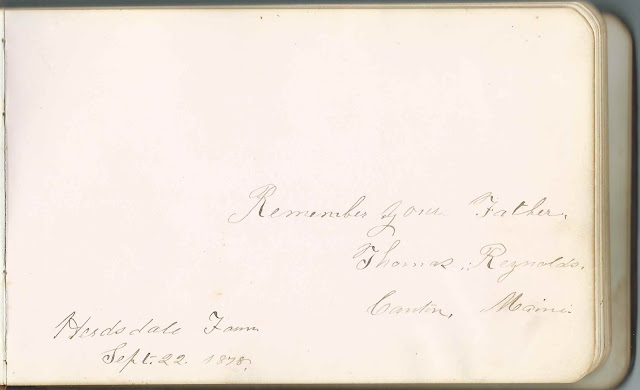 She was Lydia H. (Reynolds) Holland, wife of Cornelius Marshall Holland, who inscribed the left facing page, and paternal aunt of album owner Nellie Howe (Reynolds) Hutchinson. Edith E. Holman of Dixfield, Maine; Nellie's cousin; possibly the daughter of Horace and Betsy (Hutchinson) Holman, who was a sister to Nellie's stepmother Livonia (Hutchinson) Reynolds. Eunice E. Holt of Canton Point, Maine; "Your little friend"
Flora L. Hutchinson of Weld, Maine; inscribed on October 9, 1889; Nellie's cousin. Flora was the daughter of Charles Hutchinson and Mary Louisa (Watson) Hutchinson. Irvin W. Hutchinson of Weld, Maine; inscribed "to my Sister Nellie" on August 19, 1888. He was Irvin Wallace Hutchinson, Nellie's brother-in-law. Lucy R. Newman of Dixfield, Maine; inscribed on May 30, 1885. Written in the corner" Old Gramme 71"; not sure if Gramme is supposed to be Grammar and not sure if the date is correct.
? Reynolds, inscribed in March 1885. Initials very ornate and could be A. T. or C. T. Interestingly, Arthur Reynolds, Nellie's brother, inscribed the right facing page, but the handwriting looks a bit different. This page has an intricate bird design, though, and it's possible he was fancying up his handwriting. Nellie had a paternal uncle, Austin Reynolds, but I haven't found a record where his middle initial is displayed. This page has an intricate bird design, though, and it's possible he was fancying up his handwriting. Nellie had a paternal uncle, Austin Reynolds, but I haven't found a record where his middle initial is displayed. Arthur Reynolds of Canton, Maine; inscribed at Canton on January 10, 1883; Nellie's brother. He may have inscribed the left facing page, which features an intricate bird design, as well. 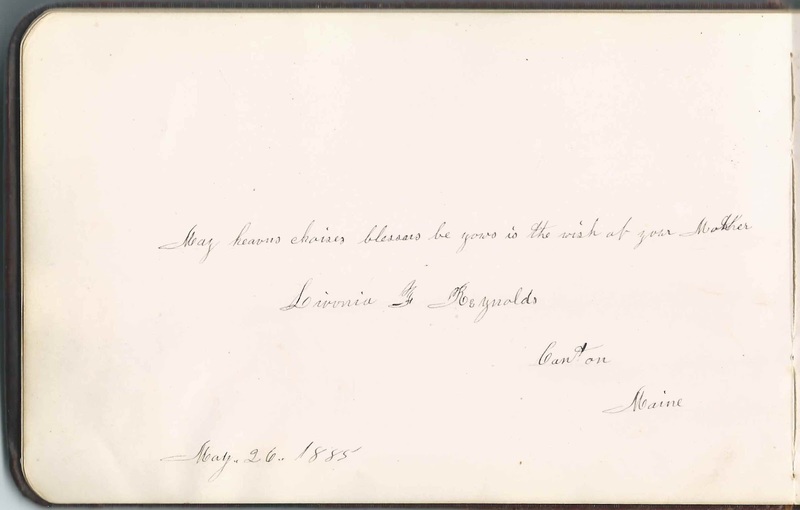 Livonia F. Reynolds of Canton, Maine, inscribed on May 26, 1885; Nellie's stepmother Livonia F. (Hutchinson) Reynolds. Nellie's mother Sybil B. 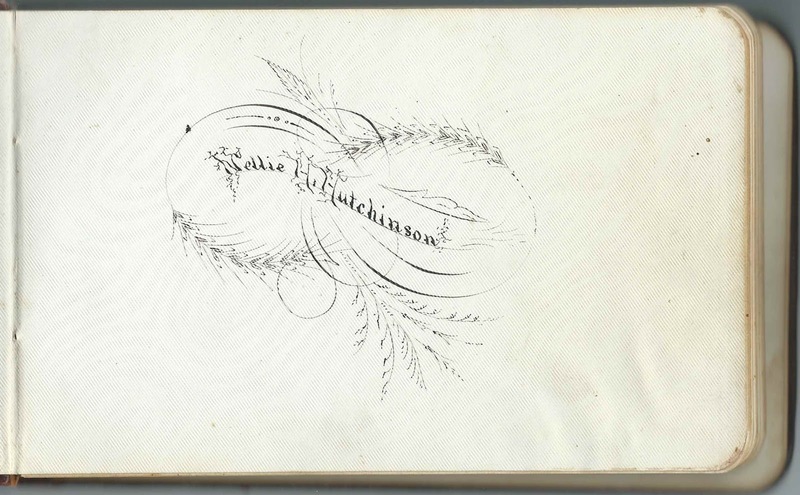 (Howe) Hutchinson died in 1866. Louise Reynolds, inscribed at Canton, Maine, on June 15, 1883; Nellie's aunt. Presumably Louisa A. (Babb) Reynolds, widow of Daniel Reynolds, Jr.
Thomas Reynolds of Herdsdale Farm, Canton, Maine, inscribed on September 22, 1878; "Remember your Father"
Danforth H. Thompson of Jay Bridge, Maine; inscribed at Canton, Maine, on January 8, 1882, His wife Florence (Forrest) Thompson inscribed a subsequent page. Florence Forrest Thompson of Jay Bridge, Maine. She was Florence (Forrest) Thompson, whose husband Danforth H. Thompson inscribed a previous page. Eben Wild of Dixfield, Maine; inscribed at February 8, 1889; mentions Royalton, Vermont, but I'm not sure if that was Eben's home or where he inscribed his page.